Vivian Springford was born in Milwaukee, Wisconsin, and educated at the Spence School in New York City, and then the Art Students League. Born to a prominent family (her father was the former president and chairman of the board of Sevel, Inc, an early maker of refrigerators), she was pictured in The New York Times “Debutantes of the Winter Season in New York” in 1932. Originally a portrait artist, she illustrated Albert Carr’s 1938 book Juggernaut with portraits of twenty political dictators from the Napoleanic era to the early twentieth century. She was championed in the late 1950s by Howard DeVree, the New York Times art critic, and Harold Rosenberg helped Springford get her first show at Great Jones Gallery in 1960. Springford provides a fascinating case study of a mid-century American woman artist. Working first in an Abstract Expressionist and then in a Color Field vocabulary, she was active in multiple facets of the New York art world from the 1950s to 1970s, during which time she had solo and group exhibitions at the Great Jones Gallery, the Preston Gallery, Women in the Arts, and the Visual Arts Coalition. With an emphasis on gesture, dripping, and splattering, Springford’s works of the 1950s bore a clear connection to Abstract Expressionism. The primary influence of her early work came from East Asian arts and letters, particularly Chinese calligraphy, Taoism and Confucianism. 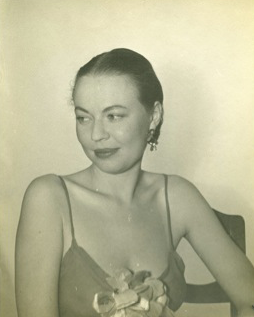 She credited the Chinese-American painter Walasse Ting, whom she met in the mid-1950s, with introducing her to Asian culture. Part of what attracted her about calligraphy as a technique was the fact that it cannot be altered once a mark is made. Her use of this technique resulted in “one-shot” paintings: virtuosic works made in a single go, without alteration or revision. By 1970 Springford had developed a manner of stain painting that was distinctively her own. Her use of thinned paint on raw or thinly-primed canvas, which she developed with her calligraphic paintings of the late 1950s, developed into more abstract and wash-like marks, with stained colored lines expanding into floods of color. This stylistic approach aligns with the Color Field painters’ exploration of stain painting as a primary mode of mark-making. Springford once remarked that, for her, the act of painting was an “attempt to identify with the universal whole…. I want to find my own small plot or pattern of energy that will express the inner me in terms of rhythmic movement and color. The expansive center of the universe, of the stars, and of nature is my constant challenge in abstract terms.” With her technical inventiveness, formal originality, and seductive use of color, her work deserves a place in the annals of postwar American art, particularly in relation to the histories of Abstract Expressionist and Color Field painting. Following her inclusion in the Denver Art Museum's exhibition catalogue, Women of Abstract Expressionism (Joan Marter 2016), the time is right for a critical revision and appreciation of Springford’s abundant talent and tireless persistence—a story that mirrors those of so many women artists, past and present. Vivian Springford Vivian Springford was born in Milwaukee, Wisconsin, and educated at the Spence School in New York City, and then the Art Students League. Born to a prominent family (her father was the former president and chairman of the board of Sevel, Inc, an early maker of refrigerators), she was pictured in The New York Times “Debutantes of the Winter Season in New York” in 1932.